Powered by Cultiva’s proprietary SureSeal™ technology, Parka™ is an innovative solution that is changing the way growers protect their crop and enhance their productivity. The design of Parka originates from an advanced understanding of the fruit’s natural cuticular layer, primarily its composition and function. 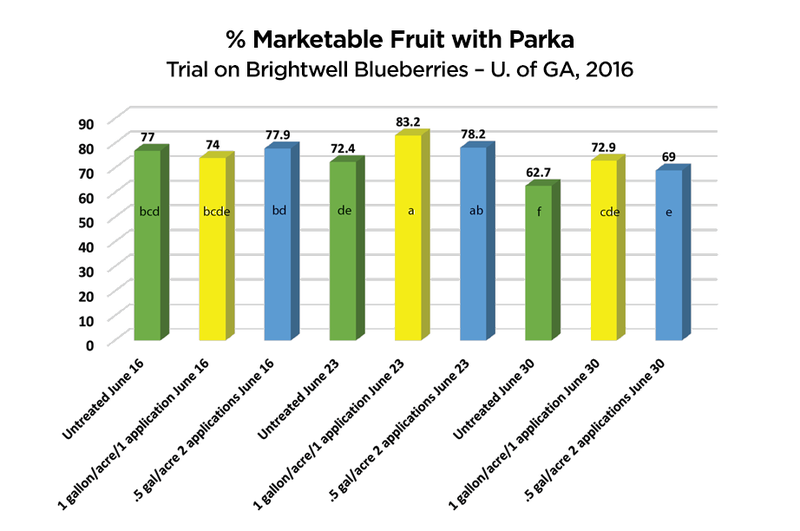 Parka’s composition of food-grade phospholipids supplements the plant’s cuticle and forms a protective shield necessary to maintain the integrity of fruit and foliage. Parka improves the plant’s natural defenses to environmental stress as well as enhances its ability to reflect harmful UV radiation. The film formed by Parka provides an elastic, uniform coating over the existing cuticle, enhancing the hydrophobic surface of the crop as well as providing a flexible vector for the implementation of additional nutrients. 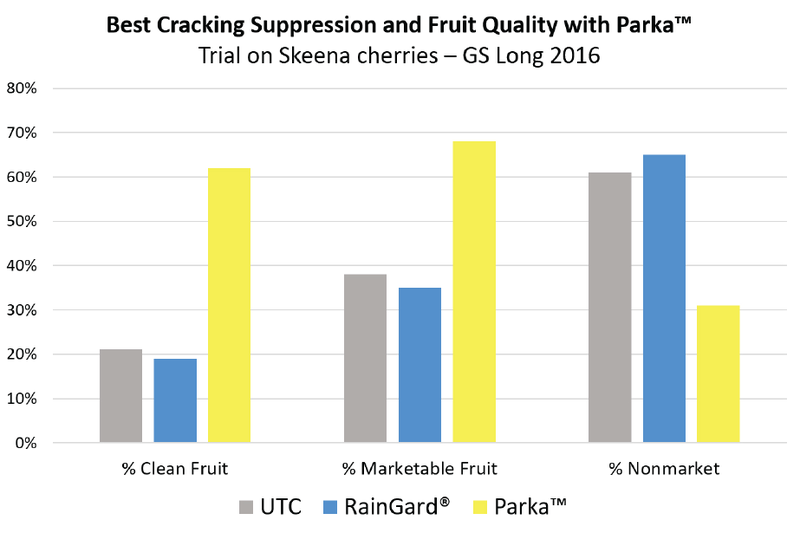 Parka slows down fruit ripening by having an inhibitory effect on ethylene production and loss of firmness. The safe and soft nature of the ingredients in Parka allow for limitless number of applications per season and no pre-harvest interval. 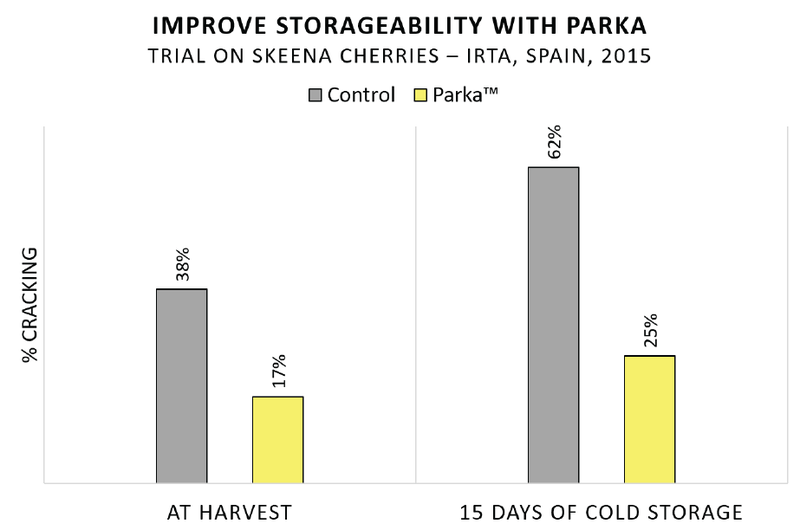 By supplementing the cuticle on cherries, Parka has demonstrated it can reduce rain cracking by an average of 50%. Its hydrophobic properties repel moisture from the fruit surface to minimize external water damage. The unique elasticity of Parka allows a simple application program starting at shuck fall. Early applications of Parka reduce the incidence of micro-fractures that develop in the cuticle which directly improves quality at harvest and shelf life. 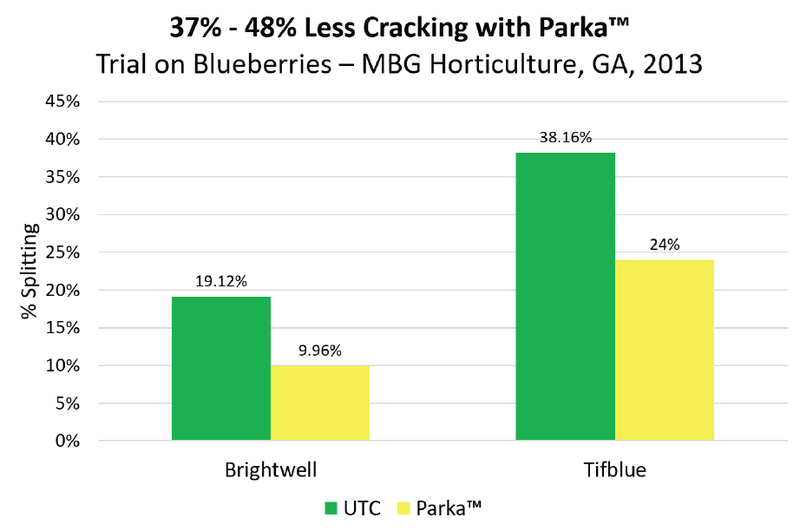 By supplementing the cuticle on blueberries, Parka has demonstrated it can increase overall packout and improve firmness of the fruit. For varieties that are susceptible to splitting, Parka applications can reduce cracking by an average of 50%. Its hydrophobic properties repel moisture from the fruit surface to minimize external water damage. 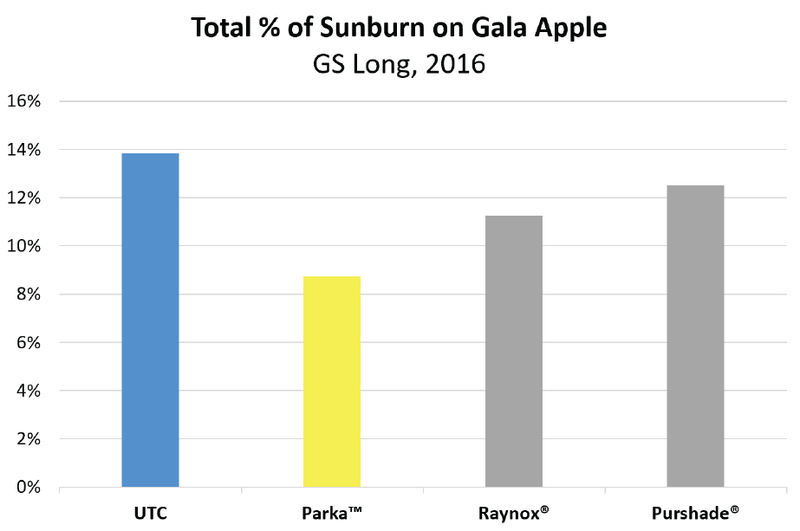 Supplementing the cuticle of apples with Parka has demonstrated improvements in quality, finish and sunburn protection. During cell elongation, apples expand rapidly causing the cuticle to fracture and making the fruit vulnerable to pathogens and yeast. Applications of Parka can fill in fractures and enable the cuticle to better expand with fruit growth. 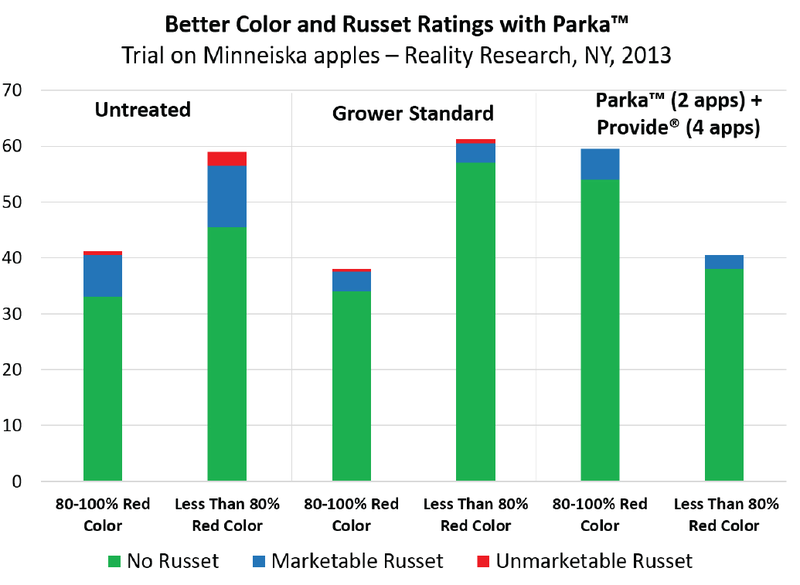 Parka also reduces the impact of heat stress and improves color development by elevating anthocyanin levels. Parka treated fruit have also demonstrated less post-harvest disorders such as stem-end splitting and bitterpit. Applications of Parka on almonds supplement the cuticle of the leaf and have resulted in enhanced yields through nut retention. The cuticle is the barrier to water loss and a key component in gas exchange and transpiration. As such, it is also key in managing crop stress under hostile environmental conditions. 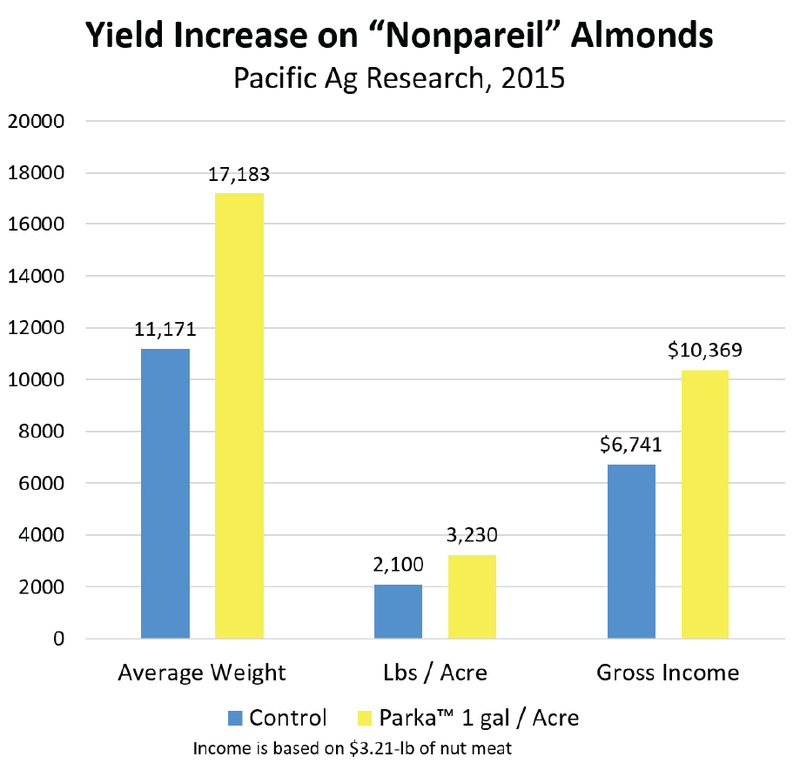 Research has demonstrated that almonds treated with Parka may drop less fruit resulting in higher yields. Research has also demonstrated almonds respond to Parka by optimizing daily water utilization. 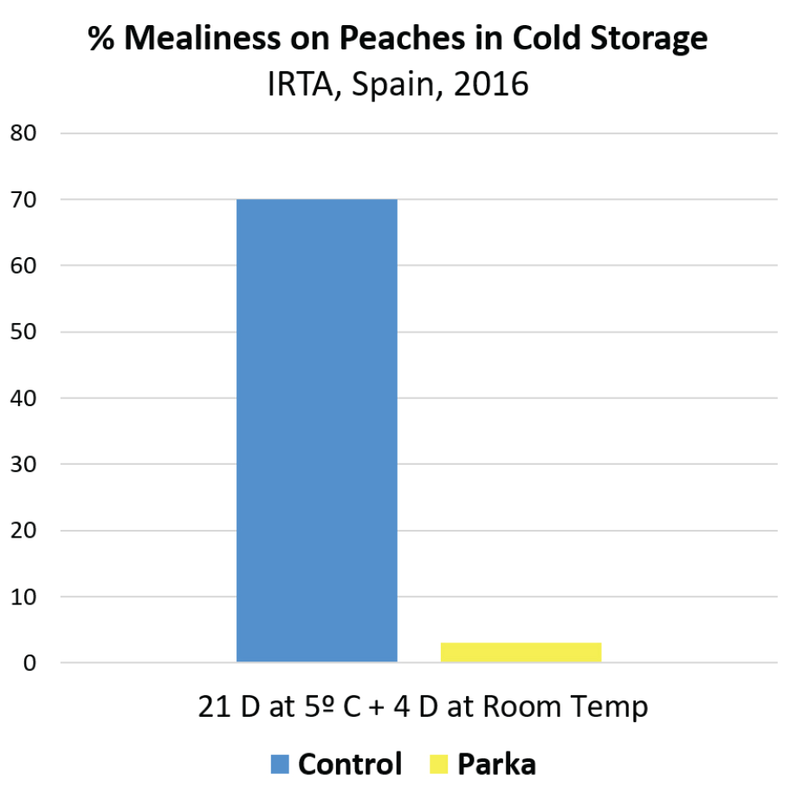 Applications of Parka on peaches and nectarines increase the hydrophobic tendency of the cuticle leading to higher fruit quality and reduce rain induced issues such as inking and black staining. Parka has also demonstrated it can mitigate chilling injury disorders, such as mealiness, by altering the ethylene production capacity.